The Charolais originated in west-central to southeastern France, in the old French provinces of Charolles and neighboring Nievre. The exact origins of the Charolais are lost to us but it must have been developed from cattle found in the area. Legend has it that white cattle were first noticed in the region as early as 878 A.D., and by the 16th and 17th centuries were well and favorably known in French markets, especially at Lyon and Villefranche. Selection developed a white breed of cattle which, like other cattle of continental Europe, were used for draft, milk and meat. The French have long selected their cattle for size and muscling. They selected for bone and power to a greater extent than was true in the British Isles. The French breeders stressed rapid growth in addition to cattle that would ultimately reach a large size. 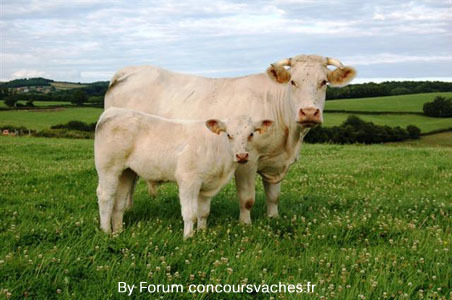 The Charolais of France are white in color, horned, long bodied, and good milkers with a general coarseness to the animal not being uncommon. Soon after the First World War, a young Mexican industrialist of French name and ancestry, Jean Pugibet, brought some of the French cattle to his ranch in Mexico. While serving as a French army volunteer he was impressed by their appearance and productivity. He arranged for a shipment of two bulls and 10 heifers to Mexico in 1930. Until the mid-1960s, all the Charolais in Mexico, the United States and Canada were descendants of this initial Pugibet herd. Due to the limited number of original animals and the import restrictions which were in place, they have been crossed on other cattle in an upgrading process. Charolais are white or creamy white in color, but the skin carries appreciable pigmentation. The hair coat is usually short in summer but thickens and lengthens in cold weather. Charolais is a naturally horned beef animal. Charolais cattle are large with mature bulls weighing from 2,000 to well over 2,500 pounds and cows weigh from 1,250 to over 2,000 pounds.